An early start, but we didn't need the alarm, for the call to prayer at 5.30 found us both awake. Breakfast was alone and although we were early, it started to feel like we were the only ones left at the hotel. The journey to the station was through some of the large squares to the west of the Medina. These were completely empty, except for the traffic passing through the narrow gates. At one there was a policeman, directing traffic, but at most entries and exits there is nothing to do but sit and wait for a gap in the oncoming vehicles. Marrakech drivers do not like delay. The small 50cc-90cc bikes and bicycles buzzed around us like a set of black helmeted insects. They squeeze through the smallest gap, with or against the flow. We travelled down some very expensive looking avenues past big villas set back in walled and gated gardens. I kept thinking, that despite its hippy trail aesthetics and the spirituality and charm of its Kasbah and markets, there is a lot of money in Marrakech. Not hidden but just tucked away from the tourists of the Medina. The station is a grand one, so grand that I went back outside just to have another look at it. All railway terminals are self important, grandiose. Many European ones hark back to neo classical styles of temples and cathedrals. Moroccan ones have a bit of the colonial past and a few bits of Arabic classicism for good measure. That sounds like I don't care for them, but I do. The railway is one of the best contributions to the improvement of our lives and it should tell it like it is. We had a compartment in first class. This means more elbow room, but not much else. I was looking forward to seeing the countryside we missed on the overnight journey, in the other direction. I hoped to be able to work out the sets of points where I woke up, or the station through which we rattled in the dark. Not really, but I had intended to start taking decent pictures through the carriage windows, something which has eluded me to date. I was disappointed to find the windows on our side were mucky. There was only one way to change this and I made my way outside, armed with a tissue to do the job. It's not as easy as it looks cleaning carriage windows. For a start they are a long way above you, especially on stations where you climb up to get into the carriage. What's more, it isn't that nobody tried to clean the train, it's not filthy, but the dirt on the window is apparently part of the glass. Or that's how it seemed to me. Rubbing away and pretending that you are really just waving to the person inside is going to get you noticed by the conductors and station staff. I knew I didn't have much time, so I wiped across as far as I could reach. It did nothing. I tried again, with more force behind the stroke. Nothing changed, the lines were all still there in every detail. People trying to get on the train began to stare at me. I moistened the tissue and tried again. It didn't help that Christina was laughing at me through the grime. Now it looked like there were two trouble makers in the one compartment. I gave up and left when I saw the conductors moving along the train in my direction. 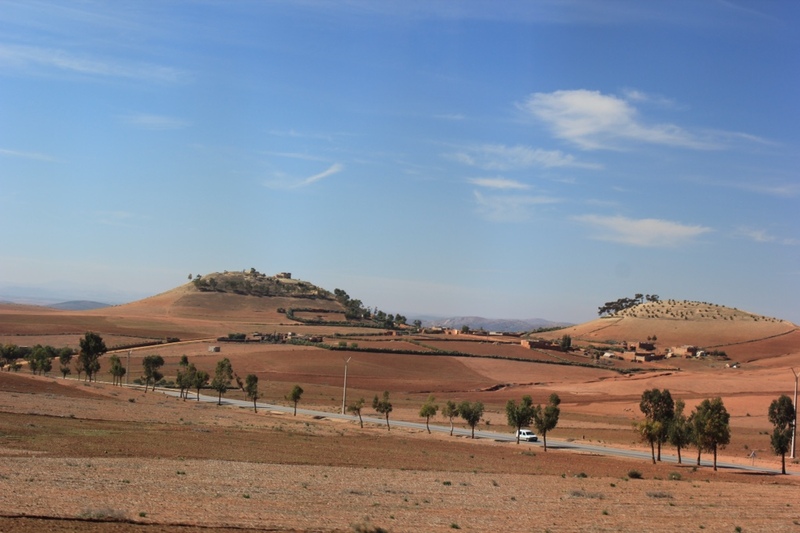 Later in the day, one of our fellow passengers said that one thing Morocco lacks is landscape. Not so. As we left Marrakech with the Atlas Mountains curving around it and snaked through passes between large hills on the other side, we emerged onto the flatter dry countryside I had seen as we arrived, four days earlier. Within a short space of time we came onto a flat plain where there were more trees and what we could not agree about, which was either a dust cloud or a mist rolling across it. Later on we came across gentle hills that could have been in England, but for the occasional palm trees; areas of terraced olive groves like Southern Europe, marshland and places where the meandering rivers had eroded the sandstone to create wide valleys. At one stage we climbed over some low red hills that looked like they had laid themselves down to let the track get across them. As we moved north, either the season became more advanced or the conditions for agriculture changed, for we began to see growth from the bare earth. It gradually turned green and the soil, from red ochre to brown. A few plantations large enough to be called forests appeared and went. Whenever we climbed above the valley floor, the vegetation became more sparse and the cacti along the trackside less varied. At lower levels we saw large Aloe Vera and other succulents. Cacti lined the field boundaries and were growing as a crop. Flowers became more abundant from the marigolds at Berrechid to large purple, red and orange shrubs before Casablanca. We saw diverse types of agriculture, but most of it fairly unmechanised. In the south there were many people in the fields including shepherds. In fact, I noticed only one flock of any size, not closely attended by someone, usually male, but sometimes female. On at least three occasions further on, we saw people hand scything a crop. The first was not a cereal but what looked like large spinach leaves, the other times were cereal-like, but still green. In all cases it cannot have been easy to cut. Even this was surpassed by the sight of a man tilling a field with a donkey, pulling a plough that would have been recognisable to a medieval ploughman. True we did see a tractor ploughing a field further on, but it was not modern by any means. In this part of the journey we saw lots of carts and donkeys, although around Rabat these disappeared and were not common again until we had passed beyond it. A man sat in our carriage with us and we talked a little. He lived in Paris but was visiting relatives in Morocco. 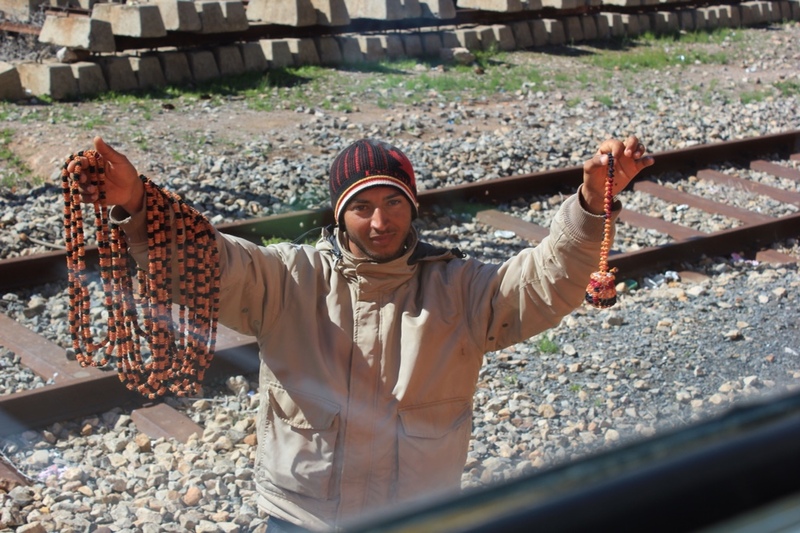 When we stopped at the station before Khemisett a group of men and boys came up to the train, selling trinkets and herbs. Some passengers including our neighbour, bought things through the door at the end of the carriage. The herb smelled like curry plant, which I have grown, but it is an ingredient of Moroccan tea. 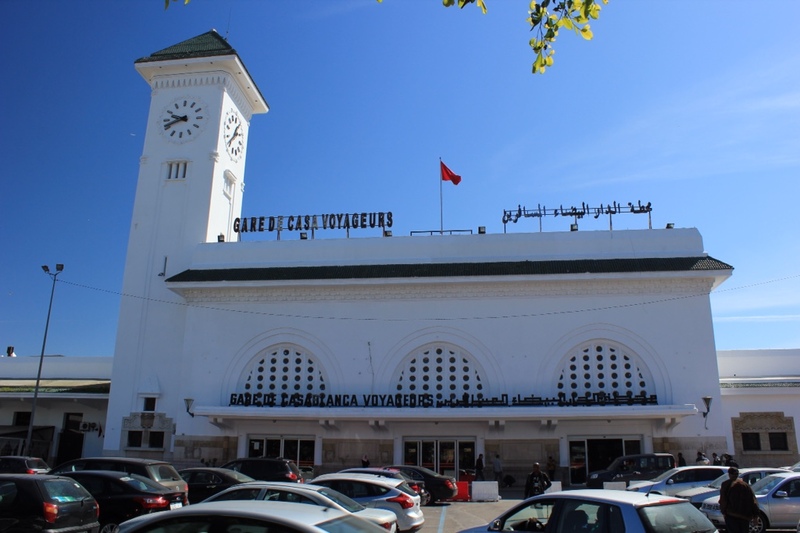 We changed trains at Casablanca (or Casa Voyageurs as the tickets called it), as the one we started out on goes on to Fes. There is very little warning of impending stops and the announcements don't give much time to get prepared when you have loads of bags to grab. We were carefully packing things, preparing early to get off at the next stop, when our compartment suddenly filled with a mother and family. As the train slowed, and we pulled bags down off the rack above our heads and picked up camera and food off the table, our suitcases rolled away towards the door. Someone grabbed them and wheeled them both to the end of the carriage and we clambered over legs and bags in the compartment and the corridor. Somehow, we found ourselves in a small heap on the platform surrounded by our belongings. Not how we planned it. We were expecting a short wait for the Tangier train. An empty train came onto the platform, but another passenger told us it was delayed due to a fault. We went and checked, were given different times by station staff, so went outside to consult the departures board. This gave us an hour and a half until departure, so we took a stroll around Casablanca. It looked prosperous and well kept. Very smart trams delivered and collected people in the city centre. The pavements were level and smooth, perfect for wheeled suitcases, should you be encouraged to visit by our positive review. The station building itself was attractive and painted white. 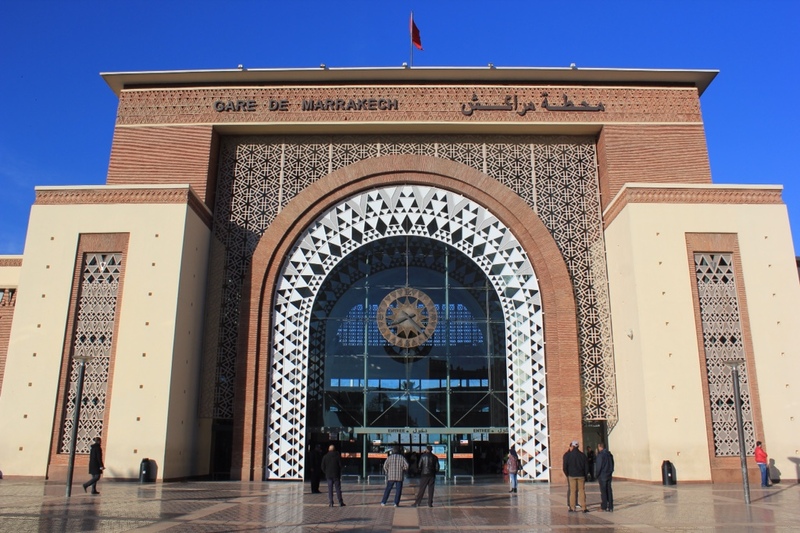 The sign above the entrance read Gare de Casablanca Voyageurs. A man tried to sell us a tour of the city. We told him we had about an hour. He rattled off a list of places we could do in an hour. We turned down the chance to see his fine city. Not that we didn't believe him, but we didn't trust the train not to be fixed early and leave without us. The destination board gave another platform for our train. We got back through the barrier onto the platform we had been on. The woman who advised us about the delay said no the train was definitely going from there. Who to believe, a stranger, or the official station information. Of course we chose her. She was right and the platform board changed its mind to concur with her opinion, a few minutes later. One thing that did not work on the train was the air conditioning. A woman got on at Rabat Agdal and sat down. Within a few seconds, the smell from the toilets began to waft in, though the train was moving. She got up to close the window. It refused to budge. I got up to help and found a tissue stuffed down one side to prevent closure. I removed it, shut the window and she sat down. A couple of minutes later and the compartment began to get hot. She got up to open the door. A man sidled in and sat down opposite her. Whether he began to attract her attention in some way, or she disliked the smell of smoke he arrived with, I don't know, but she got up and moved seats away from him. She then got up and tried but failed, to shut the window in the corridor. She shut the compartment door and sat down. He took out a phone and began to play a loud game with hideous sound effects. She got up and left the compartment. It became very hot, so we reopened the window. The smell of toilet was a minor consideration. He then got up and forced the window in the corridor closed, but opened the door. All this was done without a word being exchanged and would probably have continued to occupy us all, had a second woman not come into the compartment and got into conversation with him. Sometimes you really do have to make your own entertainment. Just before Rabat, Christina got up and went to the toilet. On coming out, the train was in a tunnel and she was, for a moment unsure which way to turn in the darkness. A cleaner grabbed her arm and led her away from the open carriage door. We had seen the doors of trains being opened before arrival at a station. After this, we noticed a number of trains with doors left open when travelling at speed. In some countries this is the norm. In Europe you're locked in before the train starts and doors cannot be opened by hand on most lines. We've probably got locks to prevent you walking out through the door at the end of the train too. Typical health and safety gone mad. Along the vast section from Casablanca to Tangier they are trying to construct a wall to stop people crossing the line, which they do, everywhere. At every station people wander over the tracks, between platforms and often from the road into and across the platforms to exit the other end. There are signs forbidding people crossing, but they do, in front of officials. At Souk El Arbaa there is a bridge over the track, but nobody uses it. They were walking around the wall, which is not properly in place anyway, to cross all the tracks. Even in Rabat people crossed the railway from the road. The wall is incomplete. In some places where the concrete sections have been fixed in place, there are openings where the wall has either been broken, or not fixed in the first place at a popular crossing point. There are lots of places where the sections are just standing as if waiting for a crew to arrive and join them up. Another problem with the wall is that it will divide communities, cut people off from their fields, their school, the local town. There were lots of people in the countryside walking beside the tracks or walking from distant settlements on paths that cut across the railway. They don't have motor transport, so what would they do if the wall was in place? Quite possibly break through it, destroying its purpose in one go. On the first part of the journey, between Marrakech and Casablanca, there is a lot of trackside work going on. In some places there are complete bridges over the tracks with no road connecting them. Elsewhere a couple of concrete pillars and a crossbeam beside the way, or even a group of men and machines digging a pair of holes. The ground alongside is being levelled and banks erected. There is no indication of what is being built, more tracks, or a road to run alongside. At Kenitra they are building platforms for a high speed train to Casablanca, but this doesn't explain the work further south. All of which seems to be going on separately and simultaneously. At Ben Guerir station, men were pouring concrete into a deep pit between the tracks one wheelbarrow at a time. From Casablanca to beyond Rabat, the country is more industrialised and the towns and cities larger. We passed along the coast for a while with a view of the sea and some resorts. At the edge of larger towns were shanty towns with roofs made of corrugated iron and satellite dishes, it appears. Between Rabat and Tangier, away from the coast, the rural nature of much of Morocco reasserts itself once more. Donkeys and walkers in vivid clothes stood out against the yellow ochre paths. At Gueddari-Rmila, people getting off the train were met by what was a taxi rank of carts. Each horse drawn vehicle took away a few people towards the distant town. Lots of polytunnels and cloches indicate a quite intensive form of horticulture and the open fields have drip irrigation systems. Personally, I was interested to see apiaries in the forests near Llala Yto. I'm not sure if the bees were there to pollinate a crop, if so, which one. The trees might have been some kind of fruit, nut maybe, but I could not tell. The smoker man got louder and the conversation with the other passenger became more one sided, until she gave up and lay across the seats with her eyes closed. Eventually, he turned to us and in English and French began a conversation about Morocco, its history, development and relationships with Europe and North Africa. He, it turns out is an academic and very knowledgeable. We talked about Tangier and how its status as an independent, 'international city' was changed in the 1960s and how it was until recently treated as a pariah by the rest of Morocco. Our discussion encompassed fashion and design Louis Quatorze and the exile of English kings offered support by Moroccan royals in the XVII century. The conversation was not wholly one sided, but we learned a lot from his knowledge and expertise. He turned out to be sensitive and engaging, so first impressions are not always to be trusted. So engrossed were we in our talk, that we barely noticed the salt pans and the marshes along the coast. We arrived at Tangier station still talking. Suddenly, the train was empty and all the lights in the compartment and corridor went out. We hadn't got our bags properly packed and down from the racks above. My phone torch was all the light we had and the four of us struggled down the corridor until we met the train staff, who were horrified to find passengers still aboard. The lone taxi driver, who had probably given up on a fare on that train, was pleased to see us. At the El Minzah, our old friend Said was exactly where we left him four days ago. We greeted like long lost relatives. Having checked in, we went outside again to find him, to say goodbye and to pass on the last of our Moroccan currency. Later, we regretted not holding some back to tip the porter and room service. Our last day in Morocco and we had seen a lot and learned more about the country. We are both enriched by the experiences of the last week and have a lot to think about. For example, how do you reconcile high speed train travel across a country where the road crossings on the intercity lines are manned and operated by hand? As our fellow passenger asked, how does an economy based on small scale hand crafts, switch to industrial production without harming the very things people come there to see, unless places like Marrakech stay frozen in time? A very enjoyable read, thanks.